Condio is a real estate One Page Joomla Template for Property or Real Estate Agent. Promote your real estate developer project with Condio and collect the information from your visitors thanks to conversion centered design of the template. Use these information to promote and inform about new changes in your project! You can use this template and Landing Page for promote and marketing. Choose from three homepage versions: Fixed or Parallax Header, Location Map and Video background to fill your needs. Promote your real estate project with stylish blocks, which are easy to create and edit. Let your visitor contact you via working contact PHP form or to contact your agent. 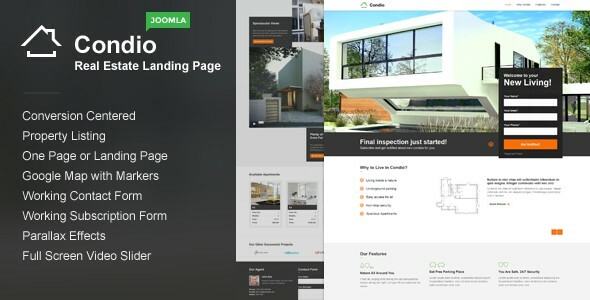 Item Reviewed: Condio Real Estate Agent One Page Joomla Template 9 out of 10 based on 10 ratings. 9 user reviews.